Pesto Chicken is a healthy baked dish that is loaded with flavor. 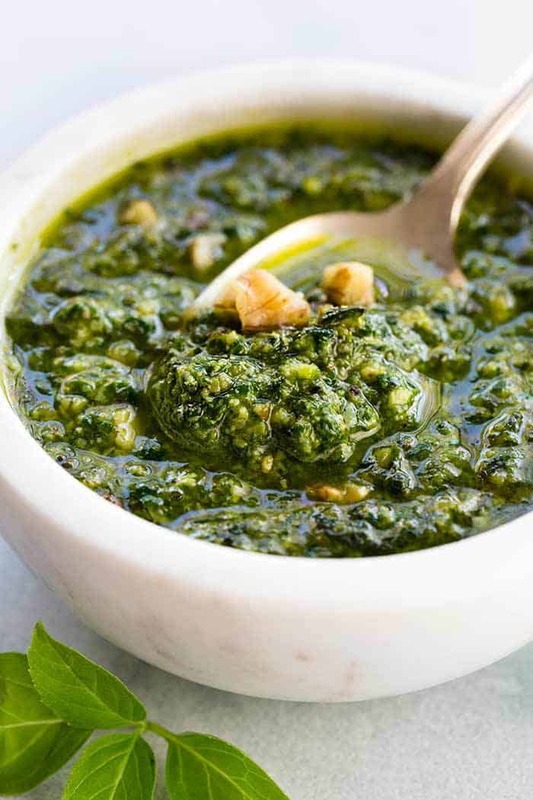 The pesto sauce is made with fresh basil, spinach, garlic, walnuts and Parmesan cheese that gets added right on top of the tender chicken to make each bite irresistible! Hi there! 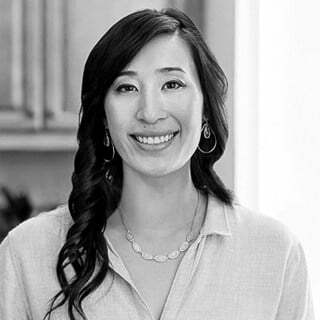 It’s Jessica Gavin, Certified Culinary Scientist and I’m excited to share with you this quick and easy baked pesto chicken recipe that’s a breeze to whip up. Lean protein cooked in the oven while a fresh and flavorful pesto sauce is made to add on top. You’re not going to want to miss my critical tips for maximizing the flavor of the pesto. This meal takes only 30 minutes to make, for a healthy dish any day of the week! When you’re looking to add a little excitement and variety to the weekly chicken dinner routine, a quick pesto sauce made with fresh herbs is your answer. Skip the store-bought jarred stuff that lacks flavor, because you can quickly make it right at home in just 10 minutes. A classic pesto sauce has basil leaves, extra-virgin olive oil, garlic, Parmesan cheese, and nuts. To make the ingredients pop with their unique flavor attributes, there are some essential preparation steps before adding to a food processor or blender. Basil has an extraordinary anise taste, which gets locked in its leaves until picked. Lightly bruising them before processing brings out the aromas of the herb, making the pesto more fragrant. As you may have experienced, raw garlic can have a sharp bite and bitterness, which doesn’t get any less noticeable once minced. To tame the garlic flavor and coax out the natural sweetness, give whole garlic cloves a toast on a sheet pan. It tastes like roasted garlic, adding depth to the pesto. Walnuts not only add creaminess and texture to the pesto, but also toasting enhances the oils delicate nutty smell. Doing these three things before processing the pesto turns up the flavor level, for a more bold and balanced sauce. One of my go-to methods for making lean chicken breasts that stays tender and juicy is baking them in a high heat oven for a relatively short period. Merely drizzling the chicken with a little bit of olive oil and season with salt and pepper adds just enough flavor without overpowering the pesto sauce. The even flow and distribution of heat in the oven keep the chicken from becoming dried out, as long as you keep a close eye on doneness. I like to have an instant-read thermometer handy to check. 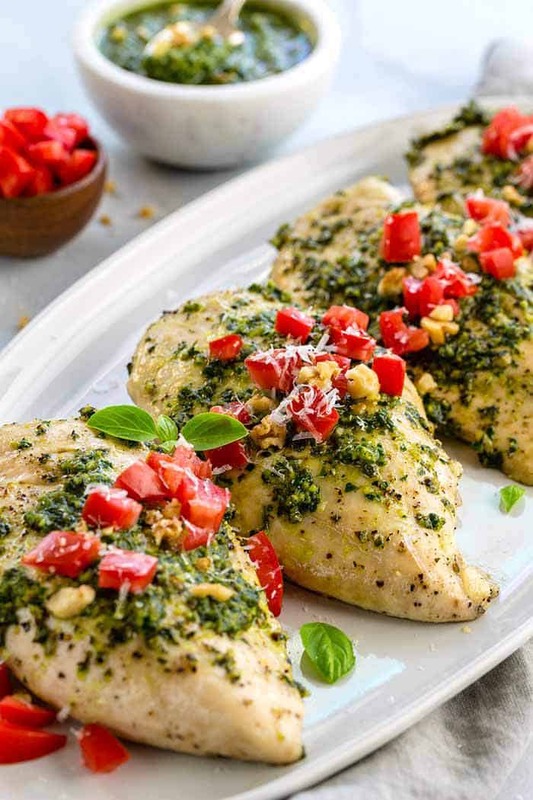 Each piece of chicken gets generously coated with some of the basil and spinach pesto, and topped with freshly chopped tomatoes, Parmesan cheese, and walnuts. This baked chicken pesto recipe is a satisfying and healthy dish, that can be served alongside pasta, zucchini noodles or crispy roasted potatoes. The recipe makes a generous amount of basil pesto sauce that can be saved and added to others meals for an extra bump of flavor! 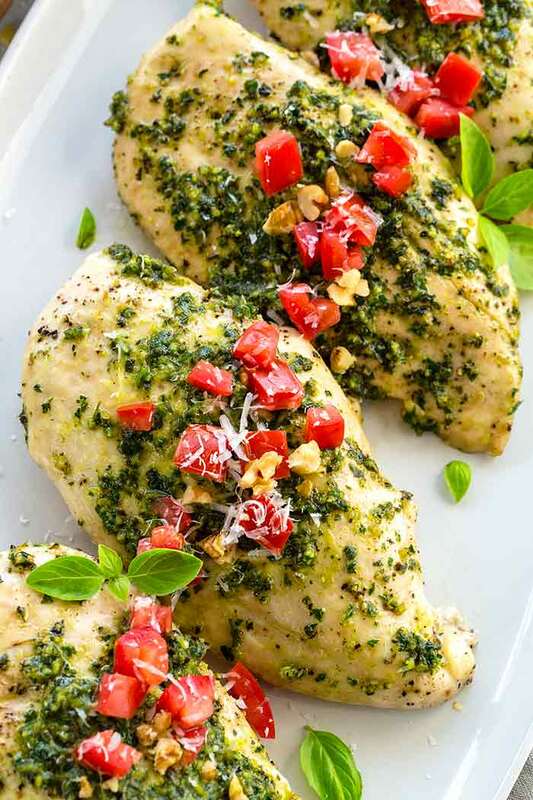 Pesto Chicken made with fresh basil, spinach, garlic, walnuts and Parmesan cheese to make each bite irresistible! Place oven rack to the center position. Preheat oven to 450°F. Drizzle both sides of the chicken breast with olive oil. Season both sides of the chicken with salt and pepper. Place chicken in an ovenproof baking dish or skillet. Bake in preheated oven until the internal temperature of the chicken is no longer pink and reaches an internal temperature of 165°F, about 15 to 18 minutes. Meanwhile, make the pesto. Place the basil and spinach in a resealable plastic bag. Use a rolling pin to lightly bruise the herbs and greens. Transfer to a food processor or blender. Place walnuts in the same pan and toast over medium heat, 3 to 4 minutes. Transfer to food processor. Add ½ teaspoon salt to the food processor. Process pesto by pulsing five times to help break down the greens. Turn food processor on low speed, as it's running slowly drizzle in ½ cup olive oil until a smooth pesto with some smaller pieces is formed, about 10 seconds from start to finish. Add the parmesan cheese to the pesto and process on low speed for 5 seconds. 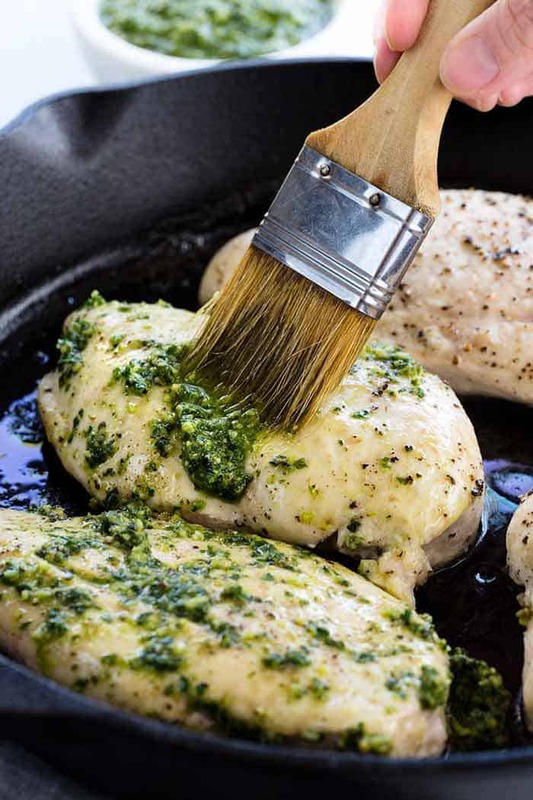 Brush some pesto sauce on each cooked chicken breast. Transfer to a serving platter. Top chicken with chopped walnuts, tomatoes, and cheese. Serve extra pesto sauce on the side.